Maybe you’ve heard about the benefits of coconut milk but aren’t sure how to use it? 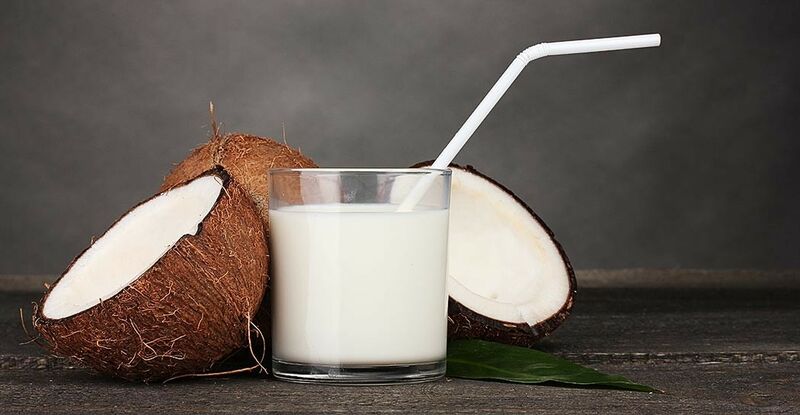 We’re talking unprocessed coconut milk—the kind that you’ll find in the grocery store’s ethnic section—rather than the equally enjoyable coconut-based milk alternatives in the refrigerator case. Coconut milk is delicious and it boasts plenty of medium-chain fatty acids, a healthier alternative to the saturated fats in dairy. Here are three creative ways to make sure that you use every last drop of coconut goodness. 1. Matcha and Coconut Milk Latte. Traditionally used in Japanese tea ceremonies, matcha is a powdered green tea available in most natural grocery stores. Coconut milk mellows matcha’s pleasantly strong taste. Heat ½ cup coconut milk and ½ cup water. Stir in 1 teaspoon honey and 1 teaspoon matcha (powdered green tea) and whisk to blend. If matcha still clumps, use a hand blender or regular blender to smooth the latte. 2. Greens Sautéed in Coconut Milk. Over medium heat, sauté ½ yellow onion in 1 tablespoon peanut or olive oil. When translucent, add 2 minced cloves garlic. Sauté for no more than 30 seconds and add 8–12 ounces of your favorite greens, such as spinach, kale or bok choy. Stir to coat. Once the greens have wilted, add ½ cup coconut milk or more, to taste. Simmer for 3–5 minutes. Add salt, to taste. Serve with rice or Asian noodles and protein of your choice. 3. Coconut-Chai Oatmeal Topper. Simmer 1 cup coconut milk with 2–3 cardamom pods, 10 whole cloves and 1 cinnamon stick over medium heat for 10–15 minutes. Strain spices. Dissolve 1 tablespoon honey or agave nectar into the coconut milk. Pour about ¼ cup over a small bowl of fresh-cooked oatmeal or other whole-grain cereal.